OUKITEL already released the new OUKITEL K6 on Christmas, according to OUKITEL, K6 already started production and will start delivery this week. OUKITEL K6 presale is still hot ongoing on Banggood, while original price is $269.99, consumers could get it at $199.99 before 2018 new year. Here we have got some details about K6 camera. 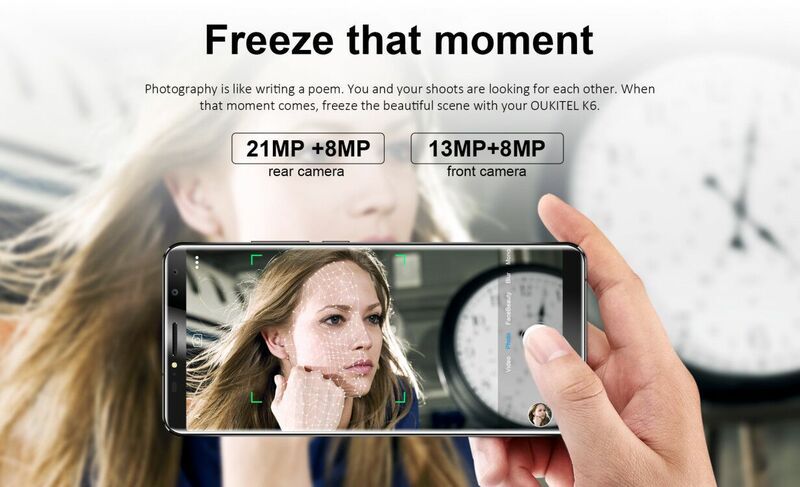 Thanks to the helio P23 soc, OUKITEL K6 is equipped with 4 cameras total. The 13MP+8MP front dual selfie cameras with a front flash take responsibility of all your selfies,while the rear 21MP+8MP camera with f/2.0 and PDAF will do the heavier lifting. And to offer quick shooting according to needs, K6 support fast capture. In off screen state, double press the volume up key, you can start record video, then double to cancel recording. You can also double press volume down key to take pictures. The latest popular Face ID recognition is also supported by front camera for additional security. Getting down to the specs. OUKITEL K6 will be a full screen smartphone with 6-inch FHD+ resolution (2160×1080), 18:9 aspect ratio and glossy back design. It is also the first helio P23 phone that starts delivery in the world. Helio P23 soc will bring LPDDR4X support, dual 4G VoLTE/ViLTE support of the Mali-G71MP2 GPU. To match the powerful CPU of P23, K6 will pack 6 GB RAM and 64 GB of internal storage. For using time, with K series of OUKITEL, never worry. K6 gets 6300mAh battery which supports 3-5 days use with one time charge by the 5V/3A fast charging. OUKITEL K6 global first presale started on Christmas until 2018 comes, among the same helio P23 smartphones, it offers best performance while with lowest price. During presale, Banggood is selling K6 at $199.99 as the exclusive store to do global first presale out of the original price of $269.99.